Ever wondered what to do with all those spare eyeballs you’ve got lying around? Maude McEerie knows how you feel! They were cluttering up her kitchen shelves until she came up with this terrifyingly tasty recipe for jelly. Serve it up at your Halloween party and watch your guests squirm! Step 1. Cut the gelatine into strips and place into a heatproof bowl. Pour a little of the lemonade over the gelatine so that it’s covered in liquid and leave for 10 minutes until it has swelled and absorbed some of the lemonade. Step 2. Take the bowl of gelatine and place over a saucepan of simmering water. Stir until the gelatine has dissolved. Add the rest of the lemonade and stir thoroughly. Step 3. Remove jelly from stove and sieve it into a jug. Pour into your mould or jar. Step 4. Pop the jelly in the fridge for a couple of hours until it’s started to thicken. Step 5. While waiting for the jelly to thicken, make your “eyeballs”. Drain the lychees and insert raisins into each one. Step 6. Once the jelly has thickened a bit, push the eyeballs into it and return it to the fridge overnight to fully set. Why not try swapping the lemonade for apple juice, raspberry juice or orange squash and the “eyeballs” for jelly snakes, teeth or spiders? 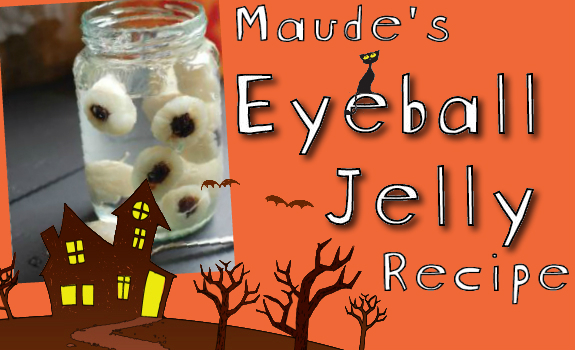 Why not try some of Maude’s other Halloween recipes?